1. What kind of wood logs do you use? 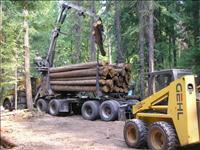 We predominantly use pine trees and logs found in Northwest Montana. Pine is excellent for log furniture since it grows fairly straight with minimal taper from top to bottom, it is available in many subspecies in our region which are all favorable for log furniture, such as Lodgepole, ponderosa, white, pinyon, and jack pine. Occasionally, we may use some juniper, popular, aspen, cedar, spruce, and larch, but only if it is requested specifically. 2. How much is shipping? Shipping is the biggest challenge that we face in this business. No matter how you look at it, it is an unpleasant expense, but one that must be paid whether built into the price or paid for separately. The craftsman has no control over the carriers' fees or service, and we create a large, heavy product. Most of the big log furniture companies with their factories and assembly lines inflate their prices to cover any and all shipping scenarios. But, the true artists, who build their furniture by hand, have to consider the cost of shipping when pricing their furniture to remain competitive in the marketplace. We are in the log furniture business not the freight business, and we are committed to offer you the cheapest shipping rates possible, customized to your specific locale, as well as the fastest and safest way to transport your new treasures to your home. We get a 60-70% commercial discount anywhere in the country, and we pass on those savings to our customers. Typically, shipping averages approximately $1.25 per pound to ship anywhere in the country. That is very reasonable, considering the cost of fuel today! Do you think you could drive to Montana and back for less than that when fuel is well over $3.50/gallon? Shipping is determined by weight, mass, and distance. You can also save another $60-70 if you have a commercial address where your furniture could be delivered. Keep in mind, the listed prices that you see are not set in stone, and most likely, we will be able to save you substantially off our regular low prices (especially if you are purchasing multiple items), which will probably pay for your shipping fees which, depending on how you look at it, could translate to “free” shipping! I hope that our discounts will make the shipping fees a bit easier to swallow! We COULD make the furnishings lighter, thus reducing shipping costs, but we build STOUT, RUGGED furniture and choose not to compromise our style or integrity by trying to save a few bucks on shipping! At least you can rest assured, knowing that you aren’t paying for a fancy showroom, expensive advertising budgets, flashy salespeople, administrative costs, and all of the other overhead that comes along with my competitors! Some businesses will charge extra for "handling", but we do not. It is expensive and labor-intensive to pack and prepare an order for shipping. It has to be protected, and those materials are expensive, but we will not charge you for materials or labor when it comes to the shipping fees. 3. Does the furniture already have a finish on it? All of the posted prices are for Unfinished furniture. Most of our customers appreciate the opportunity to save some money and elect to finish their items themselves, but we are always more than happy to put the finish on it for you, if you prefer. If we were to put a finish on every item we sell, it would price our furniture out of range for many of our customers. Finishes can come in a wide variety of prices as well, depending on how many coats, what product we use, how much finish sanding we employ, and how much labor is involved. Typically, we strive to keep our finishing affordable as well, electing to save you money while still offering a nice finish that will both improve your furniture’s appearance, but also protect it from the elements of time, weather, wear and tear, and humidity. We could put considerably more time and energy into finishing, but that expense would have to be passed on to you, and we would prefer to keep it cost-effective. So unless you insist, we elect to apply just 2-3 coats of a popular polyurethane finish to most items, sanding between coats. We would always be willing to put a more extensive and elaborate finish on your items for you, however, you must understand that it will be considerably more expensive than our standard cost for finishing, costing you at least 50% more than our standard cost! Personally, we would prefer that you finish your items yourself. To try to package and protect your finished items from the shippers is a nearly impossible feat. The shippers just do not care if they bang, scuff, scratch, gouge, or injure your furniture. If you have to try to match our finish by touching up a scratch, it becomes a huge ordeal of sanding, blending, mixing, and matching that is almost guaranteed to frustrate and infuriate you because it is nearly impossible at that point to match it perfectly. However, if you get a scratch or ding in an Unfinished item, it is very simple to just sand it out before you apply your own finish. If you have the time, space, and patience, this is a GREAT way for you to save some money! I would be happy to share any knowledge, tips, or advice that you may need to make this task easier for you! But, we realize that not everyone has the time, space, or patience to finish their items themselves, and for those customers we are always more than happy to apply the finish for you! 4. Why are there big “cracks” in the logs? All logs are subject to the natural process of "checking". 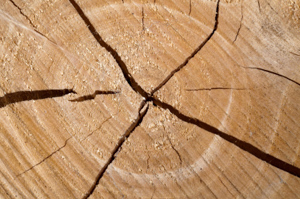 Checking, or the process of the logs cracking, happens as wood releases moisture, and normally occurs across or through the annual growth rings. It is the usual result of wood seasoning. All logs are stress tested before they enter production to ensure that they will hold up to the test of weight and time. This way when we package your furniture you will know that you will not have to worry about the durability of the log furniture. Not all companies do this, but you can rest assured that all furniture found on our site goes through this rigorous testing process. Your safety and satisfaction is of most importance to us. Checking occurs mainly on the surface of the wood and does not affect the structural performance or integrity of the wood and is thus not grounds for a return. This natural process adds to the uniqueness of the pieces and lends it that certain rustic appeal that has become so popular in home and garden decor. The degree of checking will vary from product to product and from log to log. This is rustic furniture and imperfections in the wood such as checking and knots are expected. Checking can range from very slight slivers to cracks running the full length of the log to the heart (middle of the log) of the wood. In either case this checking is completely normal and in no way affects the integrity of the wood or the strength of the furniture’s structure. 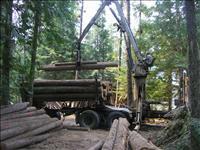 Remember that all of our logs are stress tested to ensure that they will hold up to the test of weight and time. 5. How long does it take to build? We used to have “seasons” that were busier than others, but now they ALL seem to be our busy season. We are very busy these days! It is a wonderful blessing to be in such high demand during such a difficult time for our country’s economy. You wouldn’t want to purchase from a craftsman that wasn’t busy, would you? We realize that part of offering good customer service is to produce your furnishings in a timely manner. We are a CUSTOM builder, which means that we don’t have an inventory or "on hand overstock" that we can pull from. We don’t begin on an order until it is ordered and the deposit is paid. We have an efficient shop and we work VERY hard to get every customers order out within a reasonable time frame. Usually, if we get too backed up we can hire more help to keep the wait within a tolerable period of time. Most of our items can be built from start to finish in 2-5 days, but with the demand for our work so high, and with so many paying customers ahead of you, we try our best to maintain an approximate 12-16 week waiting period, which is still reasonable for quality, custom craftsmanship. Handcrafted, custom products require considerably more time to create than factory or assembly line furniture that is mass-produced and duplicated over and over. We create beautiful, unique, authentic, everlasting art and it simply takes time! Quality craftsmanship cannot be rushed, that only creates mistakes and less-than-perfect work. We strive to operate on a "first come, first served" basis, out of fairness to all of our paying customers. We ALWAYS promise to work our tails off for every one of our customers and get their orders out as quickly as humanly possible. One thing we can promise is that it will be well worth the wait. We would hate for you to be in such a rush that you have to "settle" with a lesser craftsman, or get your log furnishings from a discount store that buys factory, or assembly line furniture, and have you be severely disappointed with your new furnishings. Believe me, not all log furniture is created equal. To save a few pennies or days upfront is not wise when it comes to log furniture. There are a lot of companies that claim to be custom, claim to handcraft your furniture, and claim to have the skills to produce quality furniture. But the truth is, the good ones are far and few between that actually build CUSTOM, handcrafted, quality log furniture. So be sure to give yourself, and us, as much time as you possibly can, so we can get your order to you as quick as we can. We offer similar prices (if not less expensive) than the warehouse/wholesale sellers and our furniture is much more beautiful, durable, and authentic! We set our prices low enough to take into consideration the cost you will pay for shipping, and low enough to make it worth the wait. And we offer some of the best log furnishings that you can find, and we offer them at unbelievable prices that you won’t find anywhere else! Overall, I am confident that you cannot find a better value for log furniture! You do not want to sacrifice quality for quantity, and please be sure that you are getting handcrafted log furniture EXACTLY the way you want it! Not many craftsmen can make that guarantee, which is what sets us apart from our competition! If you DO have a deadline, feel free to share it with us. We will do everything we can to meet your deadline, but remember that we do have other customers who are also waiting. Just know ahead of time that we cannot make a promise that we may not be able to keep. If we were to rush too fast, it would create mistakes and sloppy craftsmanship, which in the long run will only hurt us both. We work VERY hard (sometimes around the clock), and we would love to serve you! Please let us know how you would like to proceed! We look forward to hearing from you soon! 6. Do you have a catalog or brochure you can send me? We do not offer a physical catalog or brochure at this time. Our commitment and desire is to provide you with a large selection of quality log furniture and decor at the most competitive prices possible. Thus our website will be changing constantly and a physical catalog just does not make sense as it would be outdated quickly. Fancy, professional color catalogs are also very expensive to produce and distribute. We are committed to offering you the best possible furniture at the best possible price, not the flashiest catalog on the market. The expense would automatically create a situation where we had to increase our prices, and we are not willing to do that. Our website is a wonderful and cost-effective way to share and showcase our work for you. You are, however, more than welcome to print out our product pages to create your own personal catalog. 7. Do the beds, sofas, and cribs come with the mattresses? No, but we are negotiating with a couple of mattress companies to offer you a great mattress at a great price. We will let you know as soon as it has been formalized. We DO have a custom upholsterer who can make futon and chair cushions and pillows, as well as mattress pads and covers. They offer very competitive prices, with an unlimited variety of materials, fillers, patterns, stitches, designs, styles, and fabrics all customized to suit your specific sizes, needs, and tastes. Let us know what your needs are and we can get a price quote for you, as well as some samples to choose from. 8. Is there an additional sales tax added to your listed prices? NO, the State of Montana does not have a sales tax, so we are not required to charge an additional sales tax on top of our listed prices. This represents another huge advantage to you, the customer, for buying from Montana Custom Log Furniture. You are way ahead of most of our competitors, since you are saving anywhere from 5-10%, which could easily be HUNDRED$ of dollars, if you purchase from another craftsman in another state. 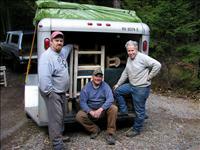 Montana Custom Log Furniture offers a 100% Satisfaction Guarantee. If any item is defective due to craftsmanship, we will replace or repair it for free. If you are not completely satisfied with your new furnishings you may return them within 7 days for a full refund (except custom orders). Return shipping will be the responsibility of the Buyer. We can provide a digital "picture story" of your furniture as it is transformed from raw logs into your beautiful works of art. This will create confidence in your purchases, so there will be no surprises or disappointments when your furniture arrives. We will communicate thoroughly from the beginning to be sure that we are on the same page, and fully understand EXACTLY what you are imagining for your new custom log furniture. We want you to be comfortable and confident with your decision to purchase your new log furnishings from Montana Custom Log Furniture. Your complete satisfaction and approval are our #1 priority! All of our listed prices are for UNfinished log furniture—that is, they have not had any color, sealer, or preservative applied to them whatsoever. They are still in their raw and natural form. Every item has been peeled, sanded, and prepared for receiving a finish, but they are still in their natural state without any kind of finish applied to them. Most of our customers appreciate the opportunity to save some money and finish their items themselves. However, not everyone has the time, space, or patience--and we are more than happy to finish their items for them. Just ask us for our finishing costs, we can usually offer fantastic discounts for finished log furniture as well. Honestly, we would prefer to ship our items to you unfinished. Not only will you save considerably, but it is much safer. No matter how carefully we pack our orders for shipping, the shippers do not share our same respect and concern for our craftsmanship. They are careless and reckless and will inevitably scratch a beautiful finish, which becomes a huge challenge for you to fix and match once you receive it. At that point, it is very difficult and expensive for us to be of much help to you. However, if the shippers scratch or scuff your unfinished furniture, you can simply sand it quickly and then apply your finish, which creates much less hassle for you! Regardless, if you are willing to accept the risk, and would prefer that we finish your items for you, we are more than happy to apply the finish to your items for you! If you choose to purchase your log furniture unfinished, we would recommend that you seal and protect your furnishings at some point, but it isn’t something that needs to be done immediately. Actually, it would be best if you can wait and give it 6 months to a year to acclimate to the humidity in your specific region before you put a finish on it. If you would like for us to finish it for you, we can offer you a great price for finishing. Just let us know if it is a project you would like to tackle. We would be happy to do it for you, but it is entirely up to you, we don’t mind either way. In fact, it may be safer to ship it unfinished, so you can easily touch up any scuffs, dings, or abrasions it may suffer during shipping, but again, the decision is yours to make. Here at Montana Custom Log Furniture, we believe it is important to support American companies and products. All of our logs and lumber come from timber grown right here in Montana, very near our shop. We buy all American made tools and products. We occasionally need work done outside of our shop and we find locally based companies and artisans to help meet our needs. All of our custom furniture at Montana Custom Log Furniture is environmentally friendly from start to finish. We hand select each log from previously fallen trees, or from logged areas where piles are left to rot or burn. We are helping to clean up the forests of waste and fire hazards. We do not cut down live, green trees, but do cut dead standing trees. We hand peel and sand each piece: we use the wood shavings around our property for things such as bedding in the chicken coop, which is then recycled as compost in the garden spot. All of our excess log ends and pieces are burned in the woodstove to heat our home and/or shop. We put our poly finish on by hand rather than spray, so as not to put that extra spray into the air and surrounding ecosystems. We ship our furniture in recycled cardboard that we collect from local businesses in our area. All of our advertising is done online, and not in published catalogs made of paper, we have not published a physical catalog because of the expense and strain on our natural resources. All of our business is done online as well, which means we are not sending paper statements or letters; it is all done online via emailing or over the phone. Our office and our shop are located at our home, so we are not traveling for work—saving on fuel and carbon monoxide emitted into the environment. NO, the State of Montana does not have a sales tax, so we are not required to charge an additional sales tax on top of our listed prices. To find out more, check out or FAQs. Shipping is the biggest challenge that we face in this business. The craftsman has no control over the carriers and we create a large, heavy product. Most of the big log furniture companies with their factories and assembly lines inflate their prices to cover any and all shipping scenarios. But, the true artists, who build their furniture by hand, have to consider the cost of shipping when pricing their furniture to remain competitive in the marketplace. We are in the log furniture business not the freight business, and we choose to offer you the cheapest shipping rates possible, customized to your specific locale. We get a 60-70% discount anywhere in the country, and we pass on those savings directly to our customers. We do not charge "shipping and handling" charges, and do NOT profit from shipping fees in any way. Freight charges are determined by length of haul as well as weight, so when we are dealing with logs there are also many variables that have to be accounted for when estimating shipping charges--log diameters, lengths, knots, species, and seasoning all affect overall weight. The rising fuel prices have also dramatically affected the shipping business. The final option to explore is driving to Montana to pick up your treasures yourself! I make the same offer to ALL of my customers, no matter where they live! We live in one of the most beautiful areas of the country!! Our home/shop borders the National Forest, Cabinet Mountains Wilderness, and Plum Creek Paper land. We have an abundance of wildlife in our region year round--including moose, elk, deer, bears, cougars, wolves, foxes, bobcats, coyotes, mountain goats, bighorn sheep, eagles, hawks, osprey, and many more native species. We live a short walk from a blue ribbon trout stream, and the former world record rainbow (32 lbs) was caught in the Kootenai River, about 10 miles from here. We have the most adorable furnished one room log cabin right down next to our creek, built specifically for our guests and customers. It has a queen sized loft bed, two bunks, a wood stove, covered porch with swing, and electric lighting. There is a campfire pit right outside the cabin, with picnic benches. We also have a 2-story tree house, with a 20-foot firemans pole. We have an airplane swing, a rope swing, and a "zip line" that can carry you across the creek. Bring the whole family and stay as long as you wish. It normally rents for $100/nite, but we offer it FREE to our customers to use for their convenience. 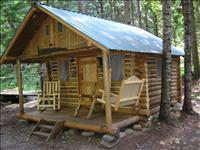 We are not in the hospitality business, but we would love to share our cabin with you and have you come stay with us! We can show you around, go sightseeing, fishing, hiking, riding, swimming, skiing, or just leave you alone so you can get some "R-n-R"......whatever your heart desires! So....not only will you save hundreds on shipping, but you will save $100 per nite, in our comfortable guest cabin, and get a few days away to relax and explore Big Sky country. Just the accommodations and activities are worth more than any $500/week vacation! What other craftsman will make those kind of offers? Whichever method you choose, shipping is expensive, which is why we work so hard to keep our log furniture prices low and affordable for all of our customers. With our multiple item discount, we have been able to save our customers hundreds of dollars (even thousands), which will definitely help to offset the cost of shipping. We would love to build your custom log furniture for you! Let us know how we can better serve you. It would be a pleasure to work with you! We realize that in today's economy we have to offer you the best log furniture at the best price, and be willing to go above and beyond to gain your confidence. We believe we are able to provide you with the best overall experience in log furniture that is available in today's marketplace. Please, don't wait too long to place your order, we have new orders coming in every day. 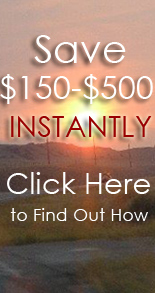 We only need a 50% deposit to get started and the balance will be due upon completion. Thanks so much, we look forward to hearing from you soon! If you need to cancel your order please contact us as soon as possible. Typically, as soon as your deposit is received, your status moves from 'Pending' to 'In Production' and the procurement process begins immediately. At this time your order has been sent to our design department, your materials and hardware are ordered, and our production staff or manufacturer partners begin the process of crafting your furniture specifically for you. Some orders move along faster in that process than others, but we always begin on your order as soon as we receive confirmation from you, in the form of a deposit. We are then responsible and financially obligated to purchase the products that you have ordered, and complete your order in a timely manner. Thus we are generally not able to accept cancellations once your order reaches the 'In Production' state. Due to the volume of business that we do however there are some cases where we are able to, at our discretion, cancel or change an order as another customer may have ordered the same piece. We understand that unforeseen events can come up unexpectedly, so we will definitely help you as much as we are able to. Some companies will allow for a cancellation but charge a cancellation fee (or restocking fee) if the order has been started. The procurement process begins as soon as your order is placed. Your furniture or accessory is being constructed specifically for you, and cannot simply be sold to another customer. Once the materials and hardware are purchased or the order has been sent to one of our vendors, Montana Custom Log Furniture is financially obligated to purchase the products ordered. Once this happens, we are not able to accept cancellations or returns. We cannot accept returns of custom furniture, furniture not in new condition or furniture made specifically for you at the time of your order We may, however, at our discretion, make an exception to this policy. If you wish to request a change, please call us as soon as possible, and we will do the best we can, considering each case on an individual basis. I also want to take this opportunity to explain our policy regarding deposits and how that affects buyer and seller responsibilities and expectations. It begins with the very definition of the word "deposit", what it implies, and the nature of this kind of business—CUSTOM log furniture. We collect a deposit from each customer as a sign of good faith that they desire to employ our company to meet their furnishing needs. A "deposit" is a commitment, an agreement, from the customer that they will complete that transaction after their furniture is completed, and it also binds us, the Seller, to fulfill our obligation to complete and deliver your furniture in a timely manner. This agreement is clearly spelled out in our invoices, so that you understand when you pay your deposit. Our commitment is to provide every customer with top quality log furnishings at fantastic prices, and to punctually provide the best service for that customer. We may or may not accept that customer's deposit, and I have chosen not to work with a number of different customers for a variety of reasons. When we choose not to accept an order from a customer, it is usually when we are too overwhelmed with orders, or we get the impression that the customer either can't afford our furniture, or we fear that they will be impossible to please and work with. Unfortunately, some customers have a "champagne taste with a beer budget", while others are difficult to work with and refuse to be satisfied no matter how hard we try. When we DO accept a deposit, we trust them to follow through with that obligation. Once we accept that deposit, we also assume some responsibility--to provide that customer with the same top quality log furniture that they have chosen, and to strive to produce that furniture in a timely manner. Our intent is to complete each order within 12-16 weeks, but sometimes circumstances are beyond our control and we require more time. We may need up to 6 months or more, but that is a VERY rare situation. Although we cannot make steadfast promises for completion dates, we DO promise to work tirelessly until all of our customers have received their orders as soon as humanly possible. Once the deposit is paid and we have accepted that deposit, we both have an agreement and obligation to make sure that we keep our commitments. Once we have received that deposit, we immediately order any and all materials that we are going to need for each order. We also use a substantial amount of payroll to choose your logs, peel your logs, cut them to size, and sand them, not to mention all of the time required in preparing, planning, and designing your order and proposal. When we are very busy and have several orders on our schedule at the same time, we may not be able to begin assembling your specific items and finishing them right away. However, that does not mean that we haven't already made a considerable investment in your order. Unfortunately, we have been burned a number of times when customers demanded a refund of their deposit, which almost fatally devastated our business financially. We are a small, intimate, family-owned business that relies on our profits to support our families. We have no desire to get wealthy or build a log furniture "empire", but we must be able to maintain a positive profit margin and keep a roof over our heads and food on the table. We cannot afford to spend unnecessary funds on payroll, materials, hardware, and utilities, only to have a customer simply change their mind or cancel their order for no apparent reason. It would be catastrophic, and we have experienced this in the past. We HAVE to protect our business and livelihood. We build CUSTOM furniture, hand-crafted specifically for each and every customer's individual needs. Every item is different and unique, built to exact specifications for each particular customer. We cannot just put it back on the shelf and simply sell that item to someone else, at least not right away. We don't have a showroom, overstock, or on-hand inventory. We don't have the luxury of additional space for storage, even if we did have the time to accumulate such an inventory. Sure, we MAY be able to sell it in the future "some time", but there are no guarantees. Besides, we have already spent the money on that order, for that customer, and can't afford to have it sitting around taking up valuable storage space without generating income. In some rare cases, we MAY be able to refund a customers deposit, or perhaps a portion of it, if we are able to sell it to another customer right away, but it would be at a discount since it was not built specifically for them. We would prefer that a customer wait until they are SURE they are ready to proceed, rather than pay the deposit for their order then have them change their mind at the last minute. We are committed to providing that furniture to that customer, and we need to be sure that every customer is just as committed to us, and that they will follow through and complete their purchase. I am a man of my word, raised with high morals and integrity. I choose to run my business with stability and honesty. But, it would be foolish for me not to protect and insulate our business from the occasional dishonest and unethical customer. Unfortunately, a few can make it difficult on everyone. Being up front and forthcoming about these issues is smart business and saves a LOT of money chasing customers or paying collection fees or court costs. The bottom line is that we are a reputable, demanding business that produces top quality log furnishings at fantastic prices. We are able to maintain our reputation and sustain the demand for our work by keeping our standards high and never settling for second best. We can keep our prices low for our customers by covering our bases before major problems arise. It may be a little inconvenient for some customers, but to the ones that understand and recognize what it takes to run a good custom business with great prices, it is well worth it in the end. Once you receive your beautiful, durable, authentic, hand-made log furnishings you will see how unbelievable our value truly is! I know this is a very lengthy and thorough explanation, and maybe even completely unnecessary, but Im sure you have a better understanding of how we choose to do business. Hopefully, this will give you even more confidence and enthusiasm in our business and the top quality furniture that we produce. Thanks so much, we look forward to the opportunity of serving you!